Finding the best baby sunscreen is key to having a safe and fun experience in the sun with the very young. Now that fall is here, I thought it would be helpful to look back and share with you my favorite baby sunscreens and other hot tips for staying cool in the summer heat. As a Floridian and mom of three, I have a little experience with this. 😉 Let’s get started! Taking a baby in the summer sun is a little bit different than say, taking a three year old. Compared to a preschooler, a baby’s skin and body are much more sensitive to the elements and what is put on their skin. 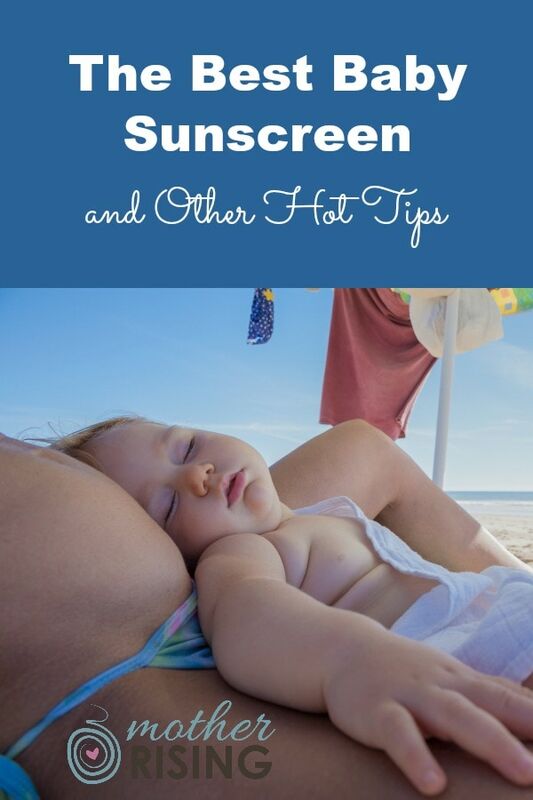 With that in mind, here are my best tips for safe sun exposure with babies. If you’ve ever looked at a bottle of baby sunscreen you may have noticed that it is not recommended to use sunscreen under the age of six months. I think this is a good rule of thumb as babies should not be exposed to the harsh, direct sunlight for very long (or the toxic chemicals of common sunscreens for that matter). This doesn’t mean that your baby cannot go outside, but that parents should make adjustments so sunscreen isn’t necessary. Use the following tips to help make that happen. During the hours of 11 – 4 pm, UV light is strongest. Keep that in mind when deciding to take your baby outside in the sun. If possible, avoid the times when the sun is strong and hot. You and baby will be happier and healthier. A hat is a fabulous way of shielding your little one from harsh rays. It covers their head (which will burn, by the way, unless they have unusually thick baby hair), shades their eyes, and sometimes even their neck and shoulders. I’m a big fan of i play’s baby hats. I’ve used them successfully with all of my kiddos. Get you one! A long sleeve rash guard is a wonderful way to minimize baby’s exposure to the sun without having to apply sunscreen. You guys, I hate applying sunscreen on my children. Anything that helps me have to use less sunscreen makes me a happy mama. Also, less sunscreen = more money in my bank account. i play wins again with their rash guards. Get you one! It is so important to protect your child’s eyes from the harsh sun, especially in super sunny places like Florida. Many parents don’t think about protecting the eyes until later in life, but there’s plenty of reason to start early. Tuga makes a really neat pair of baby sunglasses which come with straps (absolutely necessary!) that many parents like. They also come in a plethora of colors! Woot! Another tip for bringing babies in the sun is to either find shade or bring shade so that baby isn’t in the direct sun. This may look like sitting under a pavilion, tree, or beach umbrella. I really like the umbrella that BeachBub made, as it’s easy to set up and won’t blow away. A pop-up canopy is nice too, especially if you’ve got a bigger crowd. However, you’ll definitely need two adults to set it up. But the large amount of shade it provides is so worth it. There is no need to offer baby a sippy cup of water, even when it’s very hot outside. Babies can meet their hydration requirements through breastmilk or formula (whatever they’re already getting). They may need more milk/nursing sessions, but increasing water intake isn’t necessary. For very small babies, water intake can actually be dangerous. For a good article about offering water to breastfed babies, hop on over here. Parents, especially if you’re expecting, make sure you’re staying hydrated too! Plan ahead to meet the hydration requirements of breastfeeding (and pregnancy)! Of course, cooling off in water is always a lot of fun and helps keep our cool in the summer sun. But if you’re looking to minimize baby’s exposure to the sun, what’s a parent to do? If you’re at the beach, one idea is to bring a kiddie pool and set it up under a beach umbrella. Yes, it’s a lot to carry to the beach, however, I’ve heard WONDERFUL THINGS from the babies and their mamas about how happy it makes everyone. A little bit of work = happiness = peace = fun in the sun. What is the Best Baby Sunscreen? If baby is over the age of six months, exactly what sunscreens are safe and effective? In this next section we’ll discuss what parents should look for when selecting the best baby sunscreen for their child. Every year when I prep for outdoor activities, I turn to EWG’s (Environmental Working Group) website to check out the ratings for various brands of sunscreen. Just because a sunscreen is on the shelves at the store doesn’t mean that it is safe for your child. Even when it’s marketed as a “baby sunscreen”, it’s not ok to assume it’s what’s best for your baby. As frustrating as that may be, this is the reality that we live in. Generally speaking, there are two types of sunscreens – chemical and physical sun blockers. Chemical blockers shield us from the harmful effects of the sun by using, you guessed it, chemicals. One of the most problematic chemicals in these sunscreens is oxybenzone. Not only is it harmful for humans, but is also has done quite a number on coral reefs. Make sure to choose a sunscreen that does not contain oxybenzone. The other type of sunscreen is a physical blocker that shields us from the harmful effects of the sun by using minerals, which is much healthier for our bodies. When choosing a sunscreen, look for ingredients like zinc oxide and titanium dioxide when choosing the best baby sunscreen for your child. 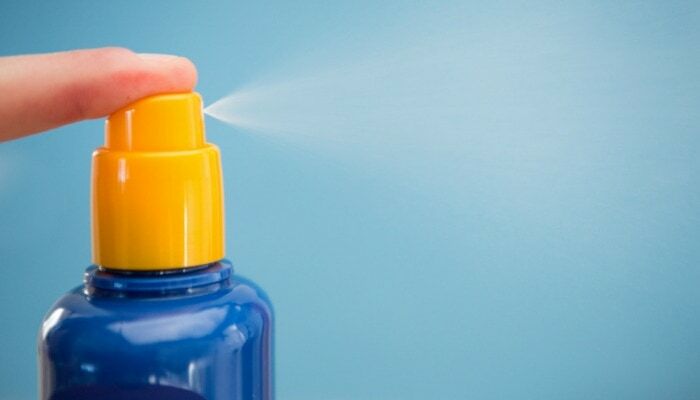 Sunscreen in the form of a spray should be avoided, especially with children. *dodges tomato* I know, I know, the sprays are so convenient and easy, which is helpful when sunscreening small children. However, inhaling the chemicals in sunscreen are really, really bad for people, especially the very young. When looking for the best baby sunscreen, do not choose a spray. Hands down, my favorite baby sunscreen was Blue Lizard Australian Baby Sunscreen! Many of the mineral based sunscreens leave this squeaky residue on the skin that is annoying. However, Blue Lizard’s residue is soft and wonderful. Not only did this sunscreen work really well, it felt good going on too. 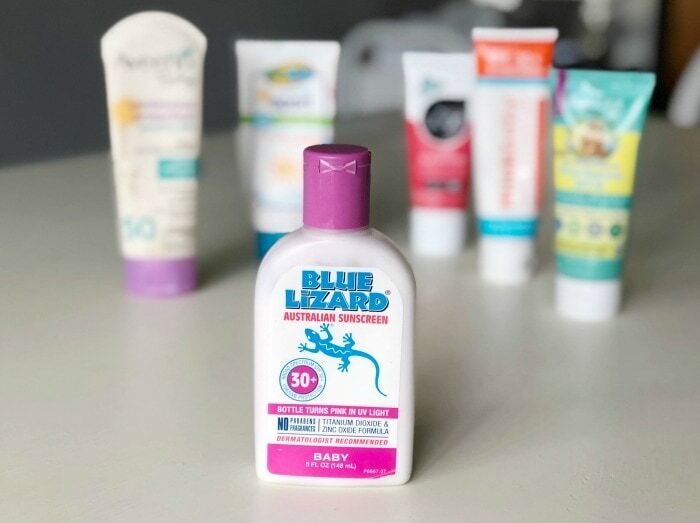 Blue Lizard’s Australian Baby Sunscreen uses the ingredients zinc oxide and titanium dioxide, which is great for sensitive skin, even the face. No tears with Blue Lizard! Blue Lizard Australian Baby Sunscreen is the winner! NOTE: I use this baby sunscreen on my toddler, school-age children, and even myself with great results. It’s not just for babies! What’s your favorite baby sunscreen? Leave a comment and share with us your story and experience. I’d love to hear from you!